BEFORE: The one-two punch of Woody Harrelson movies has been postponed. 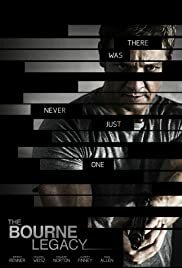 The surprise film for today is The Bourne Legacy which my dad is taking me to see on the big screen. When I first heard they were making another sequel without Matt Damon I was ready to condemn it. But after seeing the trailers, my thoughts have changed and I’m open to the idea of a Bourne film without Bourne in it. Will see how good Jeremy Renner does. On another note, today also marks the end of the second month of the movie marathon. That means it’s time for a few statistics. In August, I’ve watched a total of 3,545 minutes or 59.08 hours and written an additional 13,404 words. That brings the totals up to 7,552 minutes or 5+ days of films and 24,980 words. Average ratings have dipped slightly from 3.63 to 3.58. As far as the list goes, it saw a slight increase from the end of last month. 732 films remain on the list not including the 64 I’ve already seen (including today’s film). I’m afraid that this will skyrocket as I’ll soon have access to Emerson College’s extensive film catalog in addition to the advance screenings that are held from time-to-time in theaters. Here’s to another 10 months of movies. AFTER: Wow. A lot to say about the film, and one huge surprise about the theater. Here’s a brief overview of my reactions before the detailed version. The Bourne Legacy is not the best Bourne but it is a decent entry to the franchise. Jeremy Renner has a lot of potential and I think they just scratched the surface in Legacy. First off is the projection in the theater. I’ve been doing some searching to try and confirm my suspicions and I’m pretty sure I have. As far as I know, the presentation was in 4K. Before the film started, this trailer played and I immediately got excited that this was my first 4K experience. If it truly was 4K, I couldn’t tell any difference. It looked the exact same as a standard 2K projection. So, either it wasn’t really 4K or it was but I didn’t see a noticeable increase in resolution. I’ll reserve further comments on 4K until I see another screening. Now onto the film. The Bourne Legacy was on the extreme sides of the spectrum. The good parts were really, really good, but the bad parts were horrendous. What felt like the first hour was all setup to introduce the new operative, Aaron Cross (Jeremy Renner). We see him undergoing training in Alaska intercut with some scenes from The Bourne Ultimatum and its aftermath including footage from the third film. The idea is solid. Introduce this new character and tie it into the old one so viewers have a reason to keep watching when the realize Matt Damon isn’t back. This beginning is the biggest problem of the entire film. Tony Gilroy, the director, takes way too long with this introduction. In The Bourne Identity when we first see Jason Bourne it’s a similar situation. We have no idea who this character is, what they’re doing, and why people are coming after him. The difference between Identity and Legacy is that it takes 5 to 10 minutes to introduce Bourne whereas it takes over an hour to introduce Cross. This creates too much mystery to the point of confusion. A lot of new information keeps getting thrown at you with almost none of it being explained. About halfway through the movie is the tipping point; we finally start getting some answers. The suspense and intensity is kicked up to 11 and it becomes what a Bourne movie should be; fast and action-packed with that mystery of who Cross is looming over everything. We see a bit of Cross’ potential early on in the film, but it isn’t until this tipping point, the scene in Dr. Searing’s (Rachel Weisz) house, that Cross really shows himself. There’s lots of fighting, shooting, and, of course, the MacGyvering. By no means was Legacy the best film in the Bourne series; Ultimatum still retains that title. But there is a lot of promise in The Bourne Legacy. Not only is Jeremy Renner a great replacement for Damon but the new storyline is also intriguing. I didn’t cover the other agent programs or the all important green and blue pills that were at the forefront of this film. As far as sequels/reboots go, The Bourne Legacy is much more of a Batman Begins than an Indiana Jones and the Crystal Skull. Despite the extremely long opening, I’m really glad I saw this film and I’ll definitely be seeing the next one.